America’s antiques experts take you shopping at everyday and extra-special flea markets—you’ll see WHY collecting is fun and profitable and learn the WHEREs, WHENs and HOWs of buying and selling. View depression glass, collectible robot toys, baskets from around the world, renewal dollhouse furniture, vintage cookbooks, kitchen gadgets, Coca Cola memorabilia, cast-iron doorstops and more! These DVDs include the third season of the HGTV series, “Flea Market Finds with the Kovels,” the TV show that will make you an expert on almost anything you see at a flea market — 3 DVDs, 12 episodes in total. 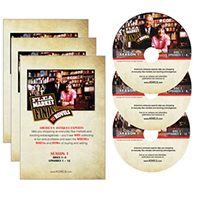 Get the complete Season 3 DVDs — ONLY $29.95! These DVDs include the third season of the series. You’ll see depression glass, robot toys, Art Deco lamps, vintage comics strips and more!